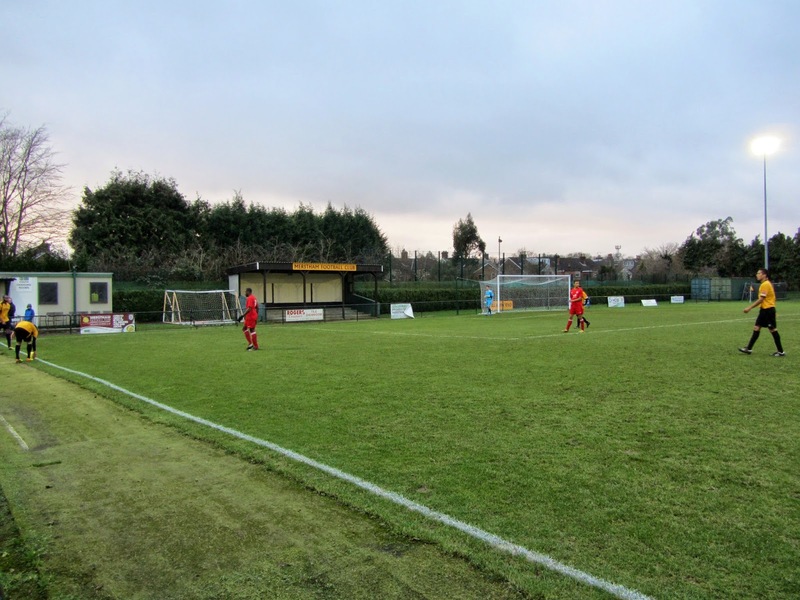 My twenty-fourth stadium of 2014 was on Saturday 27th December at Moatside in Mertham, Surrey. 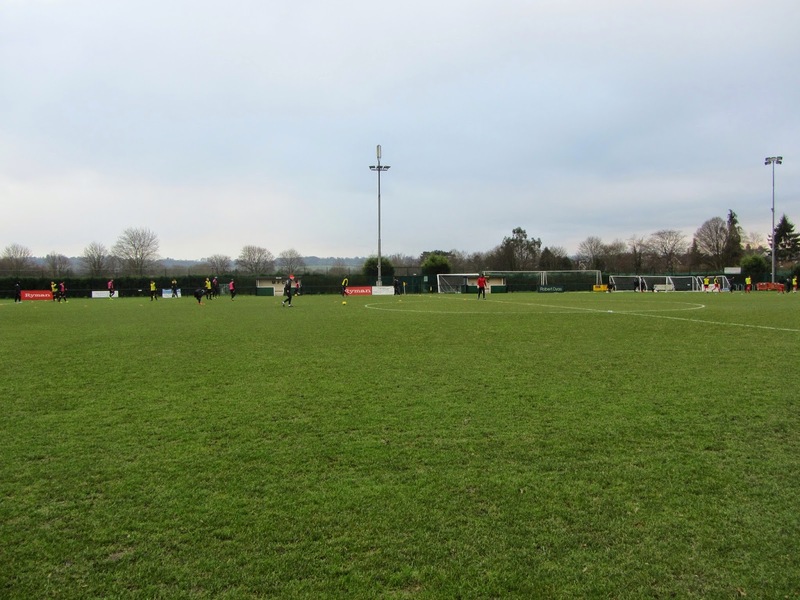 The match was Merstham vs. Chipstead in Isthmian League Division One South. Moatside sits within an area of green space in the village of Merstham on the edge of the M25 Motorway. The venue is half a mile south-east of the village railway station and has been home for the club since the early 1920s. The main stand is sited by the half-way line on the northern side of Moatside - this 174 seat structure has a divide down the middle allowing fans out towards a food outlet at the back of the stand. Adjacent to the stand is the main building known as 'The Venue' which includes the club bar as well as changing rooms and the boardroom. The Church End is located behind the eastern goal and is a concrete standing section under a metal roof which extends for around half the length of this side of the ground. At the other end of the pitch is the Albury End which has a small covered concrete terrace to the side of the goal. Additional changing rooms are also located in the south-west corner. The rest of Moatside is uncovered standing. 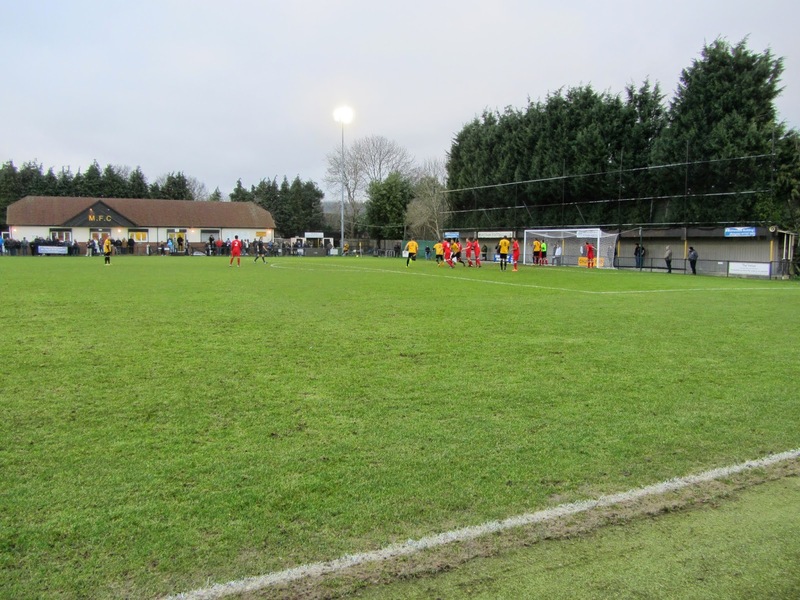 Merstham were the in-form side going into the game as they attempted to keep up their promotion push. It took them just 7 minutes to open the scoring when a ball into the box was met by Tommy Hutchings who poked home. This was almost followed by a second in the 21st minute when an effort was cleared off the line. The respite for Chipstead proved to be temporary though as in the 31st minute Merstham did go 2-0 up. Peter Adeniyi picked up the ball on the half-way line and ran through to round the keeper and tuck the ball into the net. After dominating the opening half-hour Merstham eased off a little and the second 45 minutes was a more even affair. The visitors grabbed a goal back in the 72nd minute as Will Turl headed in a corner. It looked for a while like the home side might be unable to hang on but 10 minutes from the end Dean Gunner powered in a header from a corner to restore the two-goal lead. In the last minute Adeniyi beat several defenders down the wing and then squared for Omar Folkes to make it 4-1.